I guess, we are this kind of “coffee book generation”. We all love them, but most of the time they just lie around useless and are plain decoration. But there is one book of photography in my appartment, which is different. It’s inspiring me everytime anew: This one is about Peter Lindberghs black-white photography, which marked the beginning of the era of celebrity models and redefined the image of the modern woman. Now Lindbergh has openend its archives and gave some of his greatest work to show in an exhibition in the Kunsthalle in Munich – starting from April 13th until August 27th 2017. Peter Lindbergh, who was born in Lissa in 1944, is one of the most influential fashion photographers of the past forty years. Especially in the 1990s, the German photographer was the one to give distinction to the supermodels from Kate Moss to Christy Turlington and the one who gave black white photography the naturality and purity back. Like he did to the young Kate Moss in the opening picture of this article in 1993. But much of it is published in short-lived print media, like monthly fashion magazines – but there is so much more to tell about Lindbergh. Avoiding the artifice of fashion photography, he was the first to focus on the unique personalities of his models. Instead of beautifully dressed human “clothes horses”, heportrayed self-assured and expressive persons. Often referred to as the “Poet of Glamour” or “Photographer of Truth”, Lindbergh considers himself more anti-glamour. Models like Naomi Campbell, Linda Evangelista, Kate Moss, Christy Turlington and Tatjana Patitz, among others, were young and unknown when Lindbergh photographed them in the late 1970s and 1980s. But Lindbergh also shows that twenty-five or thirty years later, they have not lost any of their beauty and personality, when he is doing some shots again. Like the one with Kate Moss. At the beach in Malibu in 1988: Estelle Léfebure, Karen Alexander, Rachel Williams, Linda Evangelista, Tatjana Patitzt & Christy Turlington. Kate Moss for Vogue Italia in 2015. Erasing hierarchy in his pictures, he captures moments of truth, celebrating the natural beauty and elegance of the person in front of his camera. He photographed iconic figures of pop culture, from Kate Winslet to Charlotte Rampling, from Eddie Redmayne to Christoph Waltz, from Tina Turner to Pharrell Williams, all with a powerful emotional appeal. Close-Up with freckles: actor Eddie Redmayne for Interview Magazine in 2013. Lindbergh was the first to use fashion photography as a medium of storytelling. Often, his images are inspired by the avant-garde cinema of the 1920s to 1950s or science fiction movies. Lindbergh was the first to use fashion photography as a medium of storytelling. Often resembling film stills, the momentariness of his photographs encourages the beholder to spin the story behind the scene. Visitors of the exhibition “Fashion to Reality” in Munich will experience the aesthetic of Lindbergh’s work across eight different sections: “Supermodels”, “Couturiers”, “Zeitgeist”, “Dance”, “The Darkroom”, “The Unknown”, “Silver Screen” and “Icons”. Shooting for Harper’s Bazaar: Model Amber Valetta in New York in 1993. Curator Thierry-Maxime Loriot – who previously presented “Jean Paul Gaultier. From the Sidewalk to the Catwalk” at the Kunsthalle Munich – explains: “This exhibition is not a chronological survey, but a narrative in which you discover the universe of Peter Lindbergh through his unique eye, his strong themes and his collaborations with artists like Pina Bausch and Jenny Holzer. Exhibition: “From Fashion to Reality – Peter Lindbergh” from April 13 to August 27, 2017. Awesome post hun. You are a great writer and blogger. So inspirational! 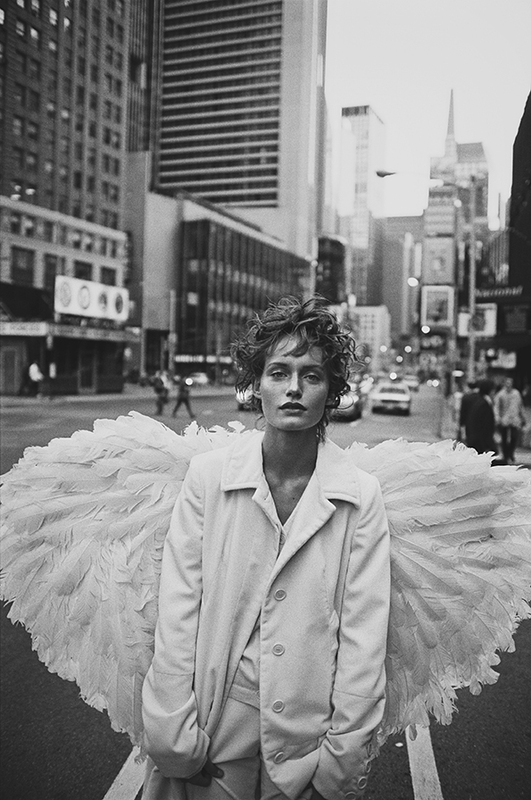 I love Peter Lindbergh and his photography. He really is a visionaire, up there with Irving Penn and Richard Avedon. It is as timeless and as ground breaking as Peter Lindbergh’s photos themself!